While heading out to eat with smaller children in tow can definitely present it's challenges, these 62 family friendly restaurants across the nation help to make it worth your while -with specially designated "kids eat free" days, every week! 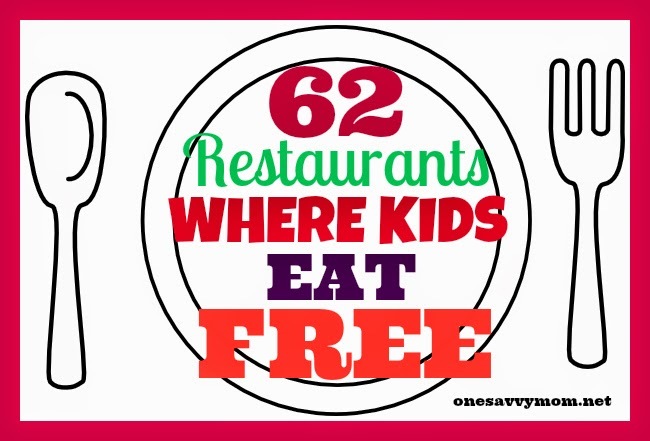 So, if your heading out to eat with the kiddo's be sure to scout out one of these 62 restaurants where kids eat FREE, in your neck of the woods! Participation may vary by location, so be sure to call ahead and check with your local chain. Cici's Pizza: Kids under 3 eat free every day. Damon's Grill: Kids eat free all day on Wednesdays. One kids' meal per paying adult. Go Roma: Kids eat free all day on Sundays. Two free kids' meals per paying adult. Golden Corral: Kids 10 and under eat free on Mondays from 5-9 p.m. Two free kids' meals per paying adult. IHOP: Kids eat free on Mondays from 4-8 p.m. One free kids' meal for each paying adult; drinks not included. Perkins: Kids eat free on Wednesdays. One free kids' meal for each paying adult. TGIFriday's: Kids eat free on Mondays and Tuesdays. The following restaurants aren't quite free, but they're close enough! Buffalo Wild Wings: On Mondays, the kids' menu is $0.99 from 5-8 p.m.
Fire Mountain: On Thursdays, get kids' buffets for $0.99. Offer valid for kids 11 and under; up to two kids' buffets per adult buffet. Old Country Buffet: On Thursdays, get kids' buffets for $0.99. Offer valid for kids 11 and under; up to two kids' buffets per adult buffet. Offer also valid at some HomeTown Buffet locations.